Football is God’s Gift to the humanity. History books are filled with sporting events which brought about peace, excitement and above all, unity amongst the people. Mandela unified South Africa through rugby. Rainbow nation’s rugby win against New Zealand in 1995, led then by a white Afrikaner became a huge symbol of racial reconciliation not just in SA but globally. Nigerians stopped civil war for two days in 1967 to watch Pele, king of soccer play. 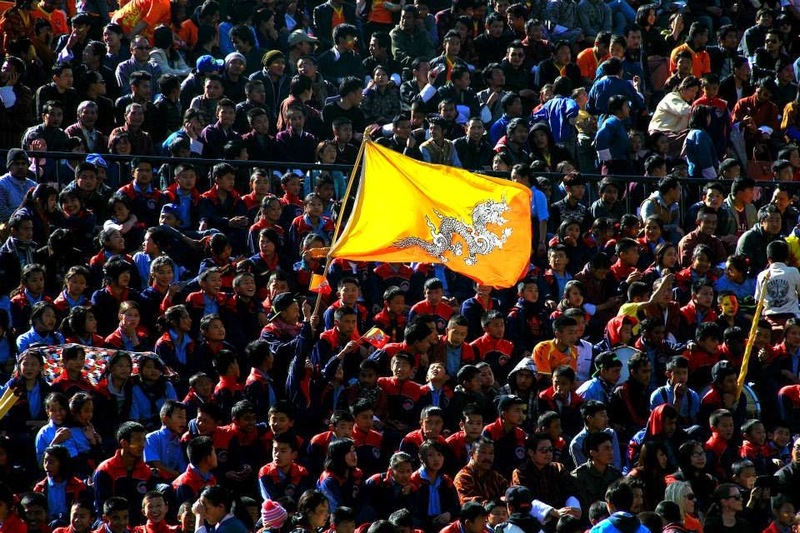 And our own Kings Cup final in 2013, when Yedzin played MMC Nepal, everyone flocked at Changlimithang to watch our boys play. After an intense national election, there was a need for national healing and football proved to be one. Our football has come all the way from getting thrashed by Kuwait in 2000 for 20-0 to a rare win against Afganistan, 3-1, in SAFF games 2008, to a clean win of 3-1 on aggregate against Sri Lanka, Fifa World Cup qualification, round one for Asia’s bottom ranked teams. We were tagged as the world’s worst team according to Fifa Coca Cola ranking and were pitted against Sri Lanka, the second best team amongst the lowest ranking Asian teams. There was literally no hope to get even a draw against the team that defeated us on our last five matches against them. Let alone the Sri Lankan former captain who labelled their match with us as not even good enough to acquire experience, even we, the football fans at home, did not see any chance. 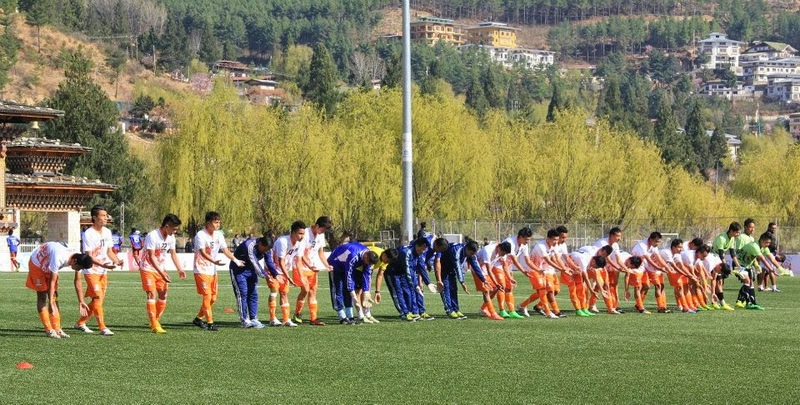 Team Bhutan thanking the crowd for the support. History however was defied. And there was nothing sweeter than the victory. To everyone’s astonishment, our boys not only did double, but defeated Sri Lankans cleanly. We were all over the media, and top of the world. 17th December is our national day, but now 17th March, 2015, shall be as historic as our national day. We not only filled our stadium packed, people were sitting atop the wall, roof, fencing, and even on a mound of earth in a distant view. It was nothing lesser than our historic national day. The atmosphere was electric; there were waves (uncountable times), there were people cheering and eruption of joy. There can never be a justice if we describe the mood in words; it simply was AWESOME. CG7 scoring the first goal. The victory shall propel football enthusiast to a greater heights, thus, propelling country even to a greater height. Sports have always been more than just a game. In Spain after Cristiano Ronaldo was bought by Madrid, the potential prospect of having him play against Lionel Messi, not only improved their league, but also had Spain’s tourist visit increased. 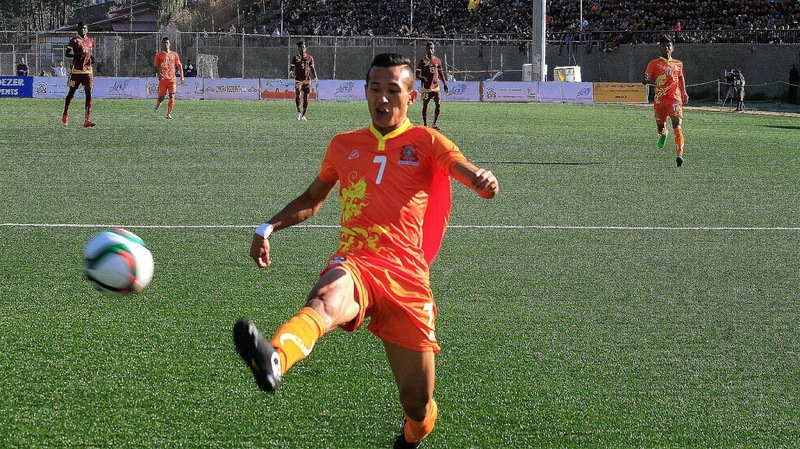 Of course, our own Cristiano Ronaldo (CR7), Chencho Gyeltshen (CG7) had us handed a huge inspirational win. 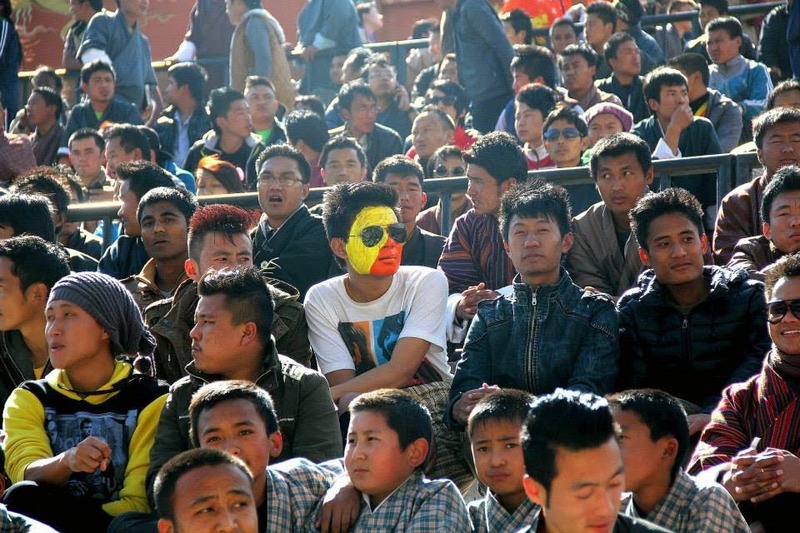 Bhutan’s tactic was pretty much like Portugal’s; get the ball to no.7 and let him do the wonders. And HE DID WONDERS. The victory was our federations too for developing these players from their early teenage. The team with average age of 22 looks promising to at least look forward for a good decade of football. With Kings Cup and artificial turfs, our national team’s awe-inspiring performance is a cheery on top. From the bottom of the ranking, we are today on top of the world. Let the Dragon roar.